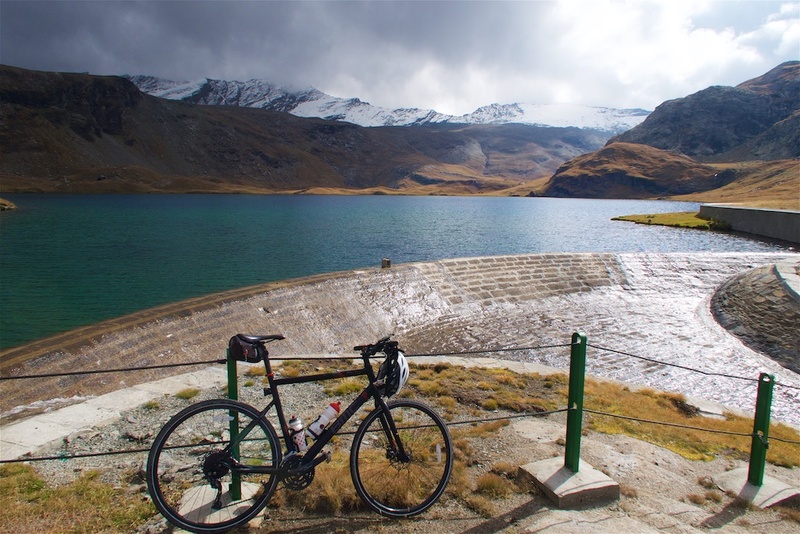 It’s tough to find a road with 2250 metres continuous climb (Stelvio has 1800m) – I can’t think of a paved climb in the Alps. This was one of the best rides of the year. 29 kms uphill with the second half unpaved and deserted. 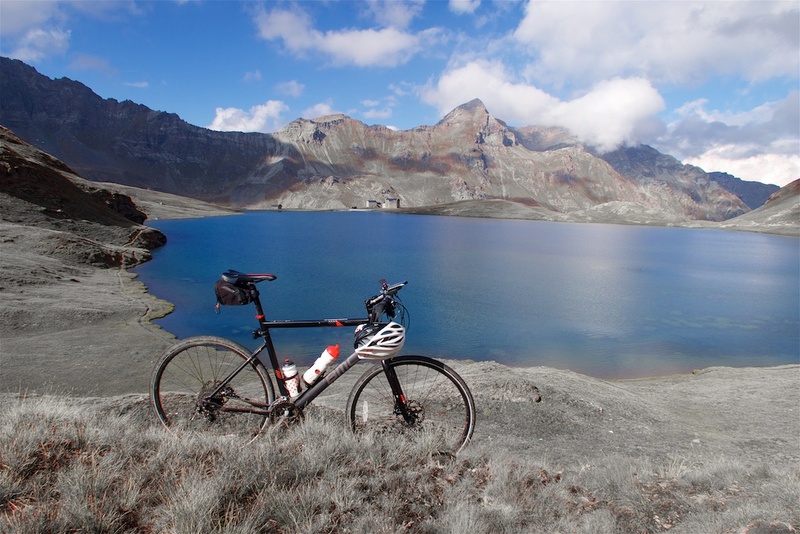 The reward at the end of the “road” – the beautiful Lago Misérin at 2580 metres. 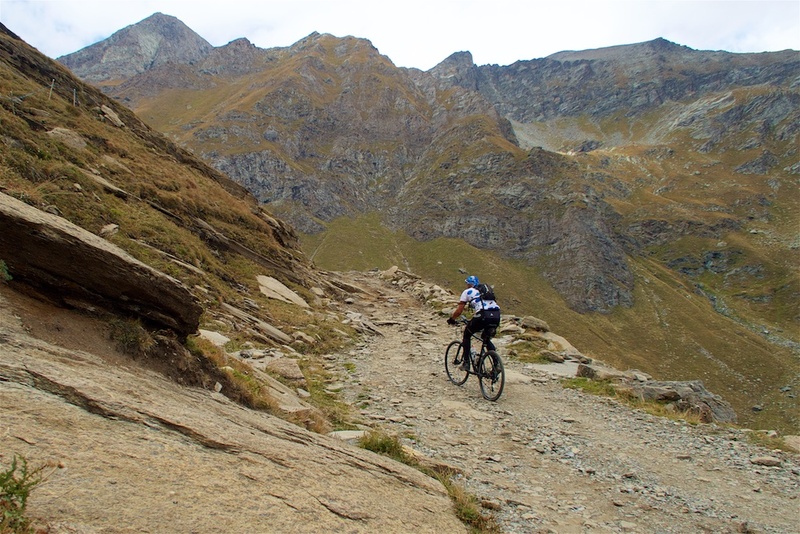 Back in June, I road-biked the paved part here – ending at roughly 1750 metres (this climb starts very low: 360m). 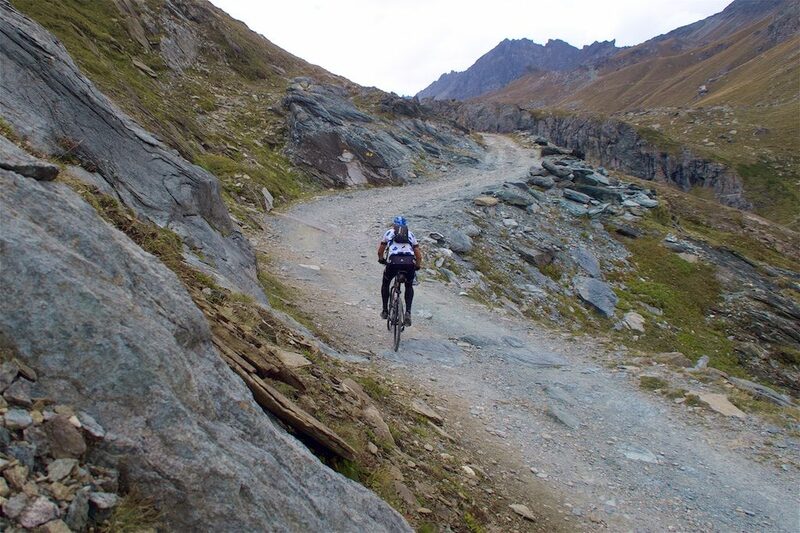 It’s a great 18km climb with the best part the 14 or so hairpins to the finish above Champorcher. But an unpaved road goes much higher. Aosta, Italy is a mecca for uphill cyclists. For more climbs in the Aosta region see here. In my previous visit, I detailed the paved stretch. It’s an interesting road, wide and fairly quiet, leading deeper and deeper into the high mountains. But we’re here to talk about the unpaved higher stretch. Initially, it’s a decent surface with fabulous views. This leads to a sort of narrow, hilly plateau. There are a few old farm buildings, some in ruins, some still in service. The road gets rougher. At times it’s littered with rocks of all sizes (see small pic above), especially during short, steep spells. I occasionally pushed, but always soon got back on the pedals. It’s a fabulous environment. It gets very steep approaching the lake but it’s worth the effort. Lago Misérin is the largest natural lake in Aosta, the Italian/French bilingual region of Italy. Hence the French sounding lake name. There is a very small dam at one edge now to manage water levels, etc. Beside the damn is the Rifugio Misérin as well as a chapelle: Notre-Dame-des-Neiges. I made a loop on a hiking trail around the lake. It’s mostly right beside the water, but there is one challenging part that requires scrambling up a hill to bypass a mound/ledge against the lake. 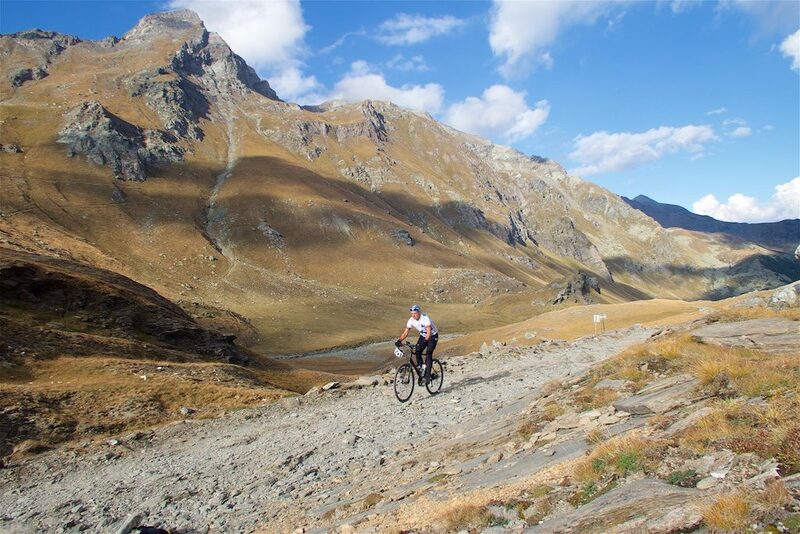 I had my hybrid bike, which was fine, but I must admit during long stretches of the descent I would have appreciated a mountain bike. I loved this ride. It’s huge, and varied. 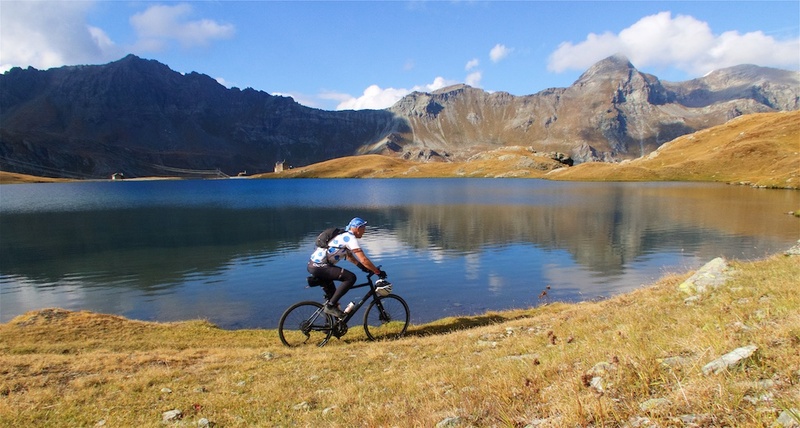 The deserted upper stretches are fantastic, and remember: no-one likes rides to high alpine lakes and dams more than me – see here for some more. Disclosure: I am getting less and less interested in riding my road bike. Not one car passed me after the 14 km point (Champorcher). Looks fantastic! Finally some great climbs closer to the Nivolet, makes justifying the detour easier 🙂 Might try this one in the future! I won’t spoil it, but I guess it might have some T’s, L’s, C’s and a dam in it! 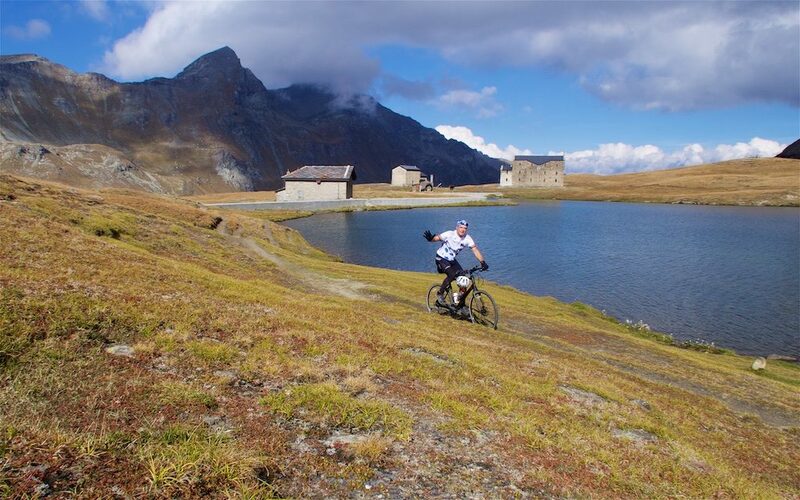 Thanks for your very inspiring blog and keep enjoying all your rides! Hi Julien, Thanks for the comment. I have to think about this. In general, I seem to mix and confuse mountain bike and gravel rides. For example this post it could have been either. It was a gravel road …. but very bumpy. Separately, I am starting to get disillusioned with disk brakes on huge, huge descents. I just wear them out so often, and am lousy at changing them so end up at the LBS. As I mentioned before, mechanical disk brakes are the ultimate solution. Avid BB7s give excellent braking and are the easiest disc brakes to adjust and change the pads because there is no hydraulic system to mess around with. That’s what I use on all of my flat-bar bikes. Thanks Chris, I need to do this. 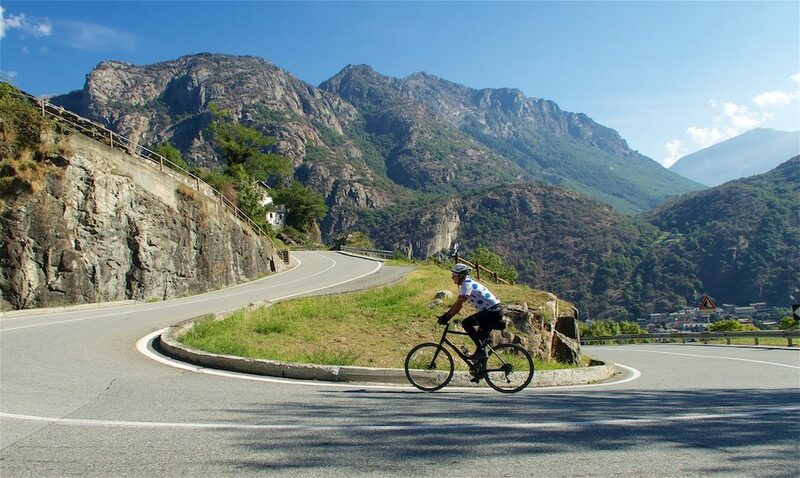 On the organizational side, if I may ask the question, where did you stay those past days while riding in the Aoste region? We’re thinking about next year’s holidays with my wife and one option would be to go in this area, so any advice regarding good places to stay will be highly appreciated! 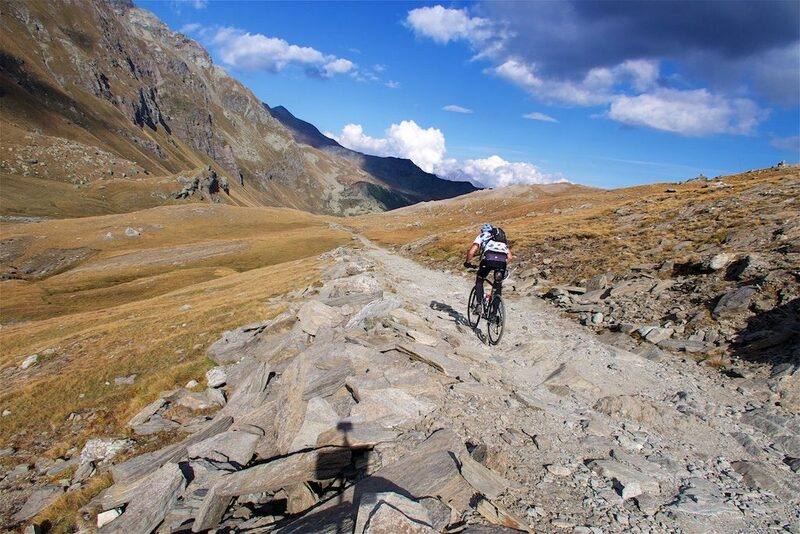 Once again, thanks for the amazing articles and pictures, really looking forward to reading your report on the Colle del Nivolet! You said that you can’t think of a paved climb in the Alps that allows a continuous climb of 2250m, but the nearby Nivolet gives over 2200 m (under 400 m to over 2600 m altitude), although the first 200 metres is very gentle (http://www.cyclingcols.com/col/Nivolet). 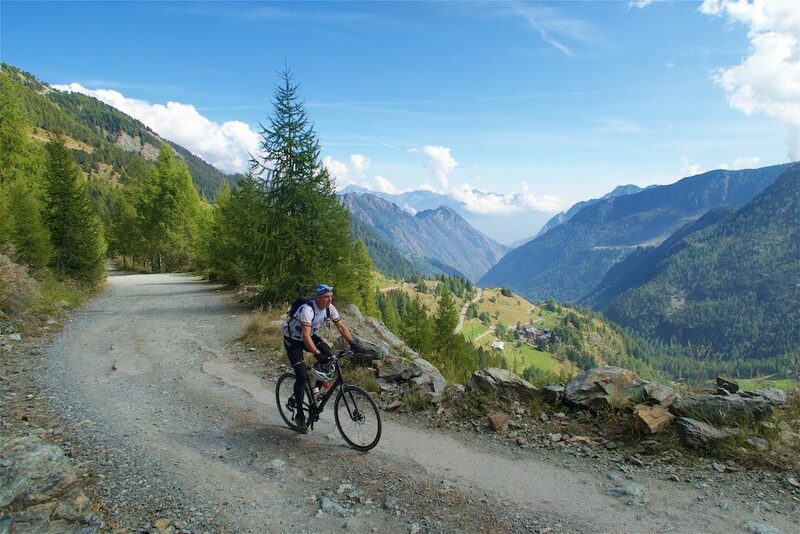 You are right that the lower part of Nivolet is not a great road to ride due to the traffic, but the only time I did it then I was starting around 7am on Sunday morning, so it was pretty quiet for a while at least, but did get busier later on.